On hot summer days in the Bay Area, high concentrations of ozone can affect your health. Ozone can irritate the respiratory system. Ozone can irritate your eyes, nose, and throat and cause coughing and headaches. These symptoms can last for a few hours after ozone exposure and may even become painful. Ozone can reduce lung function. "Lung function" refers to the amount of air that you draw in when you take a full breath and the speed at which you are able to blow it out. Ozone can make it more difficult for you to breathe as deeply and quickly as you normally would. 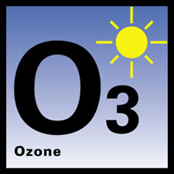 Ozone can aggravate asthma. When ozone levels are high, more people have asthma attacks that require a doctor's attention or the use of additional medication. Ozone makes people more sensitive to allergens (such as dust mites, pets, and pollen) which are the most common triggers for asthma attacks. Ozone can inflame and damage the lining of the lung. Ozone's effect on the lining of the lung is comparable to the effect of sunburn on the skin. Ozone damages the cells that line the air spaces in the lung. Within a few days, the damaged cells are repaired, just as our skin recovers from sunburn naturally. Scientists suspect that ozone may have other effects on people's health, as well. Ozone may aggravate chronic lung diseases, such as emphysema and bronchitis. Also, studies in animals suggest that ozone may reduce the immune system's ability to fight off bacterial infections in the respiratory system. Most of these effects are considered short-term, because they eventually cease once ozone levels subside. However, there is evidence that repeated short-term damage from ozone exposure may permanently injure the lungs. Other studies in heavily polluted areas have linked ozone to the development of asthma in children. Children. Children are more sensitive to pollution than adults. Children typically spend more time outdoors and are more active. Pound for pound, they breathe more than adults. Their air passages are narrower than adults', so it takes less inflammation or irritation to obstruct their airways. Children are also more likely to have asthma or other respiratory illnesses. People with unusual susceptibility to ozone. Scientists don't yet know why, but some healthy people are simply more sensitive to ozone than others.